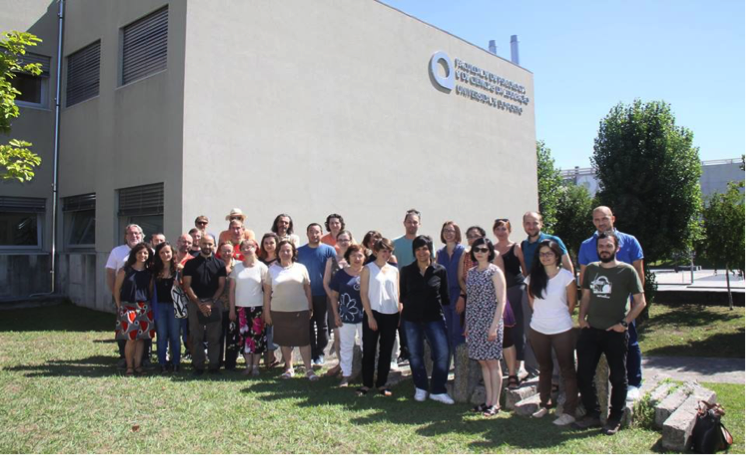 The fifth GA meeting took place in Porto and was hosted by the Faculty of Psychology and Educational Sciences of the University of Porto. Organised by the Porto team, the meeting started on July 24 and ended on July 25 – with the WP9 Intervention Management Board meeting in the afternoon. In the evening of the first day, all participants had the opportunity to relax from an intense working day, to get to know Porto downtown, and appreciate the famous gastronomy and wines of the city. During the meeting, the consortium members discussed the progresses of the project, focused on summing up the findings of the different WPs, and paved the way for the next (final) year of the project. The conclusion of WP4 and some other achievements were gladly stated, such as the second deliverable of WP7 and the first deliverable of WP8. For the third year of the project, some key activities were emphasized: the research carried out in WP6, WP7, WP8 and WP9, the theoretical integration developed in WP2, and the need of everyone’s effort on communication, dissemination, and achievement of impact (WP10). The meeting began with Elvira Cicognani reporting the main achievements of the project and the plans for the final year. Then, it was time for a summary of WP6’s findings based on the interviews with teachers and focus groups with students by Isabel Menezes and Carla Malafaia (101 interviews with teachers and 51 focus groups with students). The richness and depth of the data were highlighted, as well as the three layers approach underlying this work package (textbooks, teachers, students) that is quite innovative and promotes a novel understanding of the role of schools in fostering students’ European citizenship. Jan Šerek and Monique Landberg also reported on the findings of the first wave of the longitudinal study, providing some practical recommendations for the use of the dataset and suggesting possible changes to the questionnaire for the second wave. Sam Mejias and Shakuntala Banaji presented the 15 proposed sites of research for the ethnographic work package (WP8) – all of them quite interesting and diverse – and the plans for data analysis. Concerning the intervention in schools (WP9), Elvira Cicognani and Erik Amnå presented an update on the first year of the intervention and the plans for the second year, which will culminate in the final CATCH-EyoU conference. Regarding the theoretical work package (WP2) Shakuntala Banaji asked for inputs from each empirical work package – how theory is feeding the development of those WPs, and in what ways the empirical results contribute to the theoretical model. Lastly, Cinzia Albanesi (University of Bologna) and Lorenzo Floresta (of the Italian National Youth Forum) presented the dissemination and impact activities that took place in the previous year, and some of the activities foreseen until the end of the project. Before closing, the consortium decided on the next GA meeting, which will take place in Tartu, on February 12-13, 2018.